The nascent and, at times, challenging Vietnamese market will undergo a positive structural shift following Vietnam Airlines taking over a majority 70% shareholding in Jetstar Pacific, the Qantas Group’s Ho Chi Minh-based low-cost subsidiary. Qantas at the same time is increasing its share in the carrier, which was previously majority owned by the Vietnamese State Capital Investment Corporation (SCIC), from 27% to 30%. Jetstar Pacific is expected to become Vietnam Airlines’ only LCC brand/subsidiary, replicating in Vietnam the Qantas-Jetstar dual brand strategy pioneered in Australia and the new dual brand strategy at Japan Airlines – which also has turned to Jetstar to launch an LCC brand/subsidiary. Vietnam Airlines had been planning to launch its own LCC in 2014, but is now expected to instead piggyback on the established LCC Jetstar Pacific and be able to grow its presence in the budget sector in a faster time frame. The Qantas Group will contribute AUD7.5 million (USD8 million) as part of a wider AUD25 million (USD26.7 million) capital injection at Jetstar Pacific. The capital will be used in part to accelerate Jetstar Pacific’s long-delayed fleet renewal programme. The carrier's four remaining ageing Boeing 737-400s will finally be replaced with A320s this year and its A320 fleet, which now stands at only two aircraft, is expected to grow to 15 aircraft within the next few years. Early mover advantage will be critical, as Vietnam is projected by IATA to have the world’s third largest growing international market and second largest growing domestic market by 2014. Potential for LCCs is huge as Vietnam is starting from a low domestic LCC penetration rate, 17% – one of the lowest in Asia and the world. There will inevitably be overlap on domestic trunk routes, but Vietnam Airlines and Jetstar Pacific can co-exist, such as by having Vietnam Airlines target times favoured by business travellers as well as providing connections to international flights. Vietnam Airlines can also continue to focus on providing connections to foreign carriers, including SkyTeam partners. While Jetstar links up with full service carriers through codeshares and interlines, it is less likely that Jetstar Pacific will pursue such a strategy under Vietnam Airlines' ownership because Qantas is a member of the rival oneworld alliance. Qantas also now allows Jetstar passengers to pay extra to earn Qantas Frequent Flyer points, although this option is not available for Jetstar Pacific flights. With Jetstar Pacific becoming part of Vietnam Airlines, the national carrier will further consolidate its monopoly position domestically and internationally. Domestically, Vietnam Airlines and Jetstar Pacific will have a 91% share of domestic capacity, although that will slightly decrease as VietJet, which launched services in Dec-2011, grows its operations. VietJet currently operates two A320s with a third aircraft to be placed into service early next month. Its current schedule, which only consists of three daily return flights on the Ho Chi Minh-Hanoi route, could be operated with a single A320. 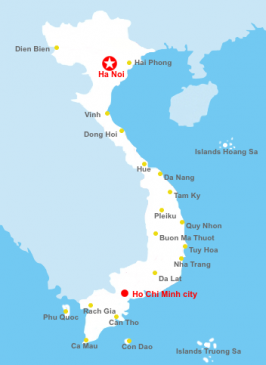 But VietJet managing director Luu Duc Khanh told CAPA earlier this month the carrier plans to upgrade its Ho Chi Minh-Hanoi service to eight daily flights by the beginning of May and launch its second route, Ho Chi Minh-Da Nang, with two daily flights starting in late April. Ho Chi Minh-Hanoi is the third largest route within Southeast Asia and currently accounts for about 30% of all domestic capacity in Vietnam. 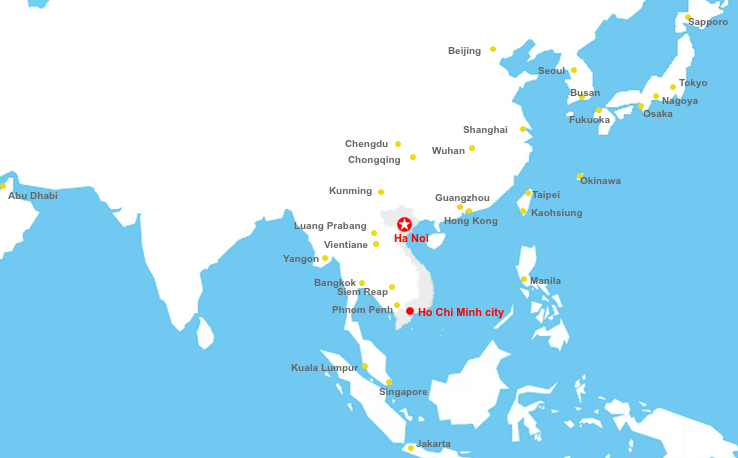 Vietnam Airlines already accounts for about 65% of total capacity between Ho Chi Minh and Hanoi while Jetstar Pacific, which operates nine daily flights on the route, accounts for another 24%. With Jetstar Pacific becoming a Vietnam Airlines subsidiary, the flag carrier will be able to better fight off competition against fast-expanding VietJet and meet growing demand at the lower end of the market. VietJet’s second route, Ho Chi Minh-Da Nang, is now the second largest domestic route in Vietnam and the second largest at Jetstar Pacific. Jetstar Pacific now operates three daily flights on the route, giving it 20% of capacity on the route compared to 80% for Vietnam Airlines. Mr Luu says VietJet fares are priced on average about 20% to 30% lower than Vietnam Airlines. Jetstar Pacific also typically undercuts Vietnam Airlines with fares on the Ho Chi Minh-Hanoi route starting at only about USD50 one-way including taxes. Privately-owned Vietnamese regional carrier Air Mekong also operates the Ho Chi Minh-Hanoi route but primarily focusses on serving regional airports such as Phu Quoc island which are not served by LCCs. Vietnam Airlines will likely maintain its leadership position at Vietnam's regional airports, which for the most part are unlikely to gain service from Jetstar Pacific or Vietnamese LCC start-up VietJet. Vietnam Airlines and its regional subsidiary VASCO now serve almost 40 domestic routes compared to only five for Jetstar Pacific and one for VietJet. Jetstar Pacific does not yet fly internationally and under the new ownership structure is planning to focus initially on the domestic market. But it is expected to launch international services in the medium term. VietJet is also aiming to launch international services late this year. When Jetstar Pacific does enter the international market, Vietnam Airlines' group international market share could be boosted beyond the current 40%. Although no Vietnamese LCC currently operates international services, Vietnam's international market has an LCC penetration rate that is, unusually, almost as high as the domestic market. 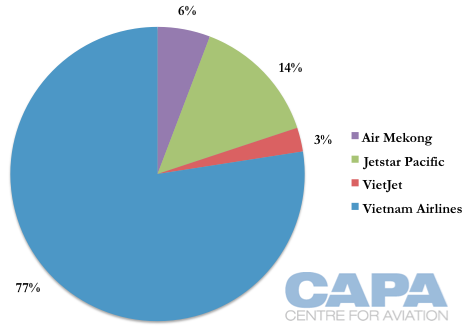 LCCs now account for about 16% international capacity in Vietnam. The AirAsia Group (including AirAsia Malaysia, Thai AirAsia and Indonesia AirAsia) is now the largest foreign airline group in Vietnam, accounting for 5% of total capacity. 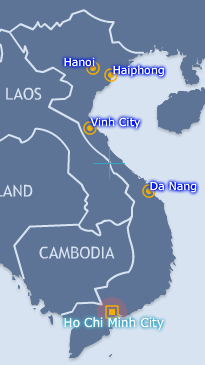 Almost all foreign LCC capacity in Vietnam is deployed on routes within Southeast Asia. LCCs now account for 100% of capacity between Vietnam and Indonesia, 42% between Vietnam and Singapore, 40% between Vietnam and Malaysia and 15% between Vietnam and Thailand. 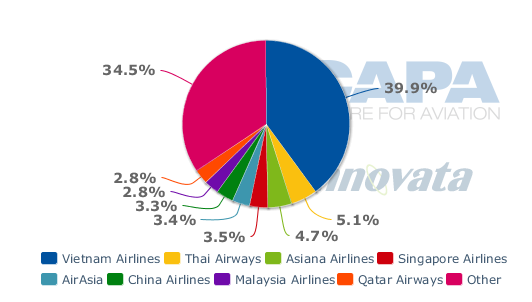 Vietnam Airlines could use Jetstar Pacific to respond to increasing LCC competition in all of these markets, in particular Indonesia, Vietnam and Thailand as Singapore is already served by Jetstar Asia. But when it launches international services Jetstar Pacific will likely initially emphasise North Asia and, in particular, China. CAPA reported in Sep-2011 that the China market was a main driver in Vietnam Airlines’ decision to start preparations for its own budget brand. Vietnam Airlines now serves four destinations in mainland China but saw a need to establish a new budget product to tap the market’s tremendous growth potential, particularly secondary cities where there is not much business demand. 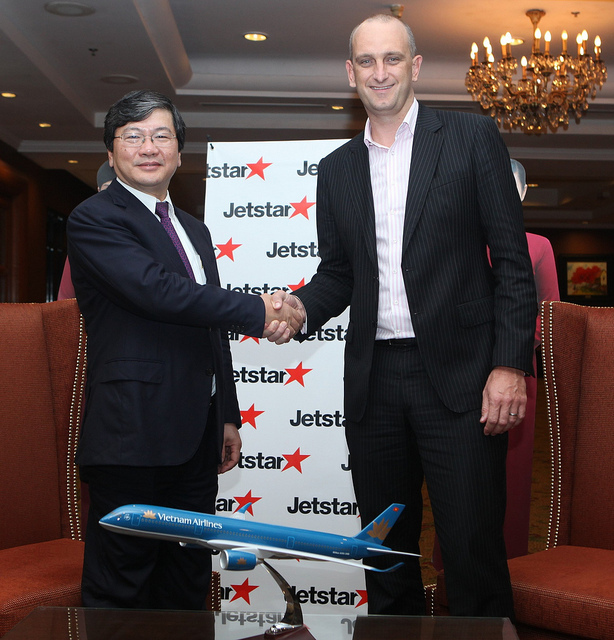 Vietnam Airlines is no longer expected to launch its own LCC as Jetstar Pacific fills this void in its portfolio. Jetstar Pacific was already evaluating prior to the new partnership with Vietnam Airlines potential destinations in China, where it can leverage existing Jetstar infrastructure because Jetstar Asia already serves several mainland Chinese destinations. Mr Luu says VietJet is also studying potential destinations in China along with Japan and Southeast Asia as the carrier aims to begin international services by the end of this year. Vietnam-China is a relatively underserved market with huge potential if LCCs are able to enter and stimulate demand. There are currently only about 23,000 round-trip seats per week provided in the Vietnam-China market, according to Innovata data. 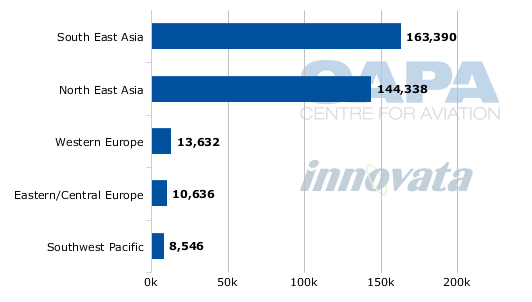 There are now about twice as many seats provided in the Vietnam-Singapore market. Overall growth in Vietnam's international market will easily be large enough to support services from both Jetstar Pacific and Vietnam Airlines as well as a new entrant such as VietJet. Vietnam Airlines could reduce frequency to some international markets more oriented towards the leisure sector, but Jetstar Pacific will primarily be used to open routes to international destinations not already served by Vietnam Airlines or operate supplemental frequencies on fast-growing routes such as Ho Chi Minh-Bangkok. For Jetstar Pacific, the agreement is a reprieve to an uncertain future. There has been a challenging relationship between the Vietnamese Government and the Qantas Group. Jetstar helped tiny Pacific Airlines adopt the LCC model, which culminated in 2007 with Pacific Airlines adopting the Jetstar branding. The remaining shareholder in Jestar Pacific was government-backed SCIC. Jetstar Pacific struggled for several years to compete with national carrier Vietnam Airlines. Growth and fare increases were tightly regulated. Tensions heightened in Dec-2009 when Vietnam prohibited Australia-backed Jetstar Pacific executives from leaving the country as part of an investigation into fuel hedging losses, a matter that created a diplomatic row. The future of the Jetstar branding in Vietnam was also not certain after the Government decided to prohibit local airlines from using foreign brands. This move ultimately led to AirAsia pulling out of its planned joint venture with VietJet to create VietJet AirAsia and had Jetstar concerned that it could be forced to re-brand Jetstar Pacific. The uncertainty prompted the Jetstar Group to repeatedly delay expansion plans and the renewal of Jetstar Pacific’s fleet. Jetstar Pacific initially had plans to operate a fleet of 14 aircraft by the end of 2009. The carrier's domestic network also has been shrinking over the last year, dropping from seven to five destinations as service to Hue and Nha Trang were suspended. Jetstar Pacific’s outlook started improving in the second half of last year. Jetstar Group decided to resume the stalled fleet renewal programme and told CAPA last September that Jetstar Pacific’s 737s would finally be retired by 2013. It also said at the time the carrier’s A320 fleet would expand from two to 10 aircraft by the end of 2013. Jetstar has now agreed to further accelerate this fleet plan, with the remaining 737s exiting the fleet in favour of A320s later this year. The revised fleet plan also now includes four additional A320s for a total of 14 aircraft. Jetstar has not yet specified when the fleet in Vietnam will reach 14 aircraft but it will likely be 2014 given the prior fleet plan envisioned 10 A320s by the end of 2013. Perhaps the most important by-product of the Vietnam Airlines-Jetstar Pacific deal is it should end the uncertainty over the Jetstar Pacific brand. It is now highly unlikely the Vietnamese Government will ask Jetstar and Vietnam Airlines to re-brand the LCC. VietJet will clearly be monitoring any potential changes in the Government’s policy relating to use of foreign airline brands as VietJet could still seek to partner with a foreign LCC, either AirAsia or another Asian LCC group such as Singapore-based Tiger Airways. Mr Luu points out that the overall policy of the Government is to open up Vietnam’s aviation sector. For example, the Government has been increasing the cap on domestic fares, which has been seen until now as a constraint on LCC growth because LCCs typically price last-second tickets at a high fare to help offset the cheaper promotional tickets that are sold well in advance. VietJet could also benefit from the Vietnam Airlines-Jetstar partnership because it means Vietnam Airlines has scrapped plans to launch its own LCC to compete against both VietJet and Jetstar Pacific. VietJet could have struggled in such a scenario given the power of Vietnam Airlines and Jetstar. Having to compete only against a Vietnam Airlines-supported Jetstar in a market that should be large enough to support two LCCs is a much less challenging scenario. Further aiding VietJet is the government’s policy against authorising at least for now any new carrier in order to ensure the market does not get oversaturated. As a result VietJet is essentially guaranteed it will be one of only two LCCs operating domestically in Vietnam, which should help the carrier attract foreign investment, especially if the rule on foreign branding is dropped in light of the Vietnam Airlines-Jetstar partnership. As part of the change of ownership, Jetstar Pacific will now receive a new CEO and chairman that are yet to be announced. Jetstar Pacific’s existing CEO and chairman were representatives of former shareholder, SCIC. At the same time, however, Jetstar has learned from its growing pains in Vietnam with Pacific Airlines. For future subsidiaries, which Jetstar is actively considering, the group is unlikely to re-brand and re-position an existing airline as it has found changing entrenched mindsets is too difficult. Instead it will likely work with non-airline partners or with an airline partner to create a new carrier (as is occurring with Japan Airlines to launch Jetstar Japan). The government support for Jetstar Pacific is remarkable considering the sour relations of just a few years ago. Critical to government support has been the backing of the national carrier. Although Vietnam Airlines planned to launch its own LCC in coming years, it likely realised the extensive resources necessary were already present in Jetstar Pacific. The deal is a win-win as Vietnam Airlines provides the local market expertise Jetstar has lacked and political backing while Vietnam Airlines gains an established LCC with a strong existing brand. With Vietnam Airlines in its camp, Jetstar also gains a huge strategic advantage over the country's only existing LCC, VietJet, and any potential new entrants, such as a new affiliate from Jetstar rival AirAsia. Jetstar Pacific will now likely be favoured politically – at least unofficially – over VietJet. But VietJet is also confident in the Vietnamese market and has an ambitious expansion programme in place that could quickly make it as large as Jetstar Pacific, despite Vietnam Airlines’ involvement in the latter. Mr Luu says VietJet will soon take delivery of its third A320 and plans to add two to three A320s by the end of this year, giving it a fleet of five to six aircraft. VietJet's first three A320s are all being leased from ALAFCO and are only three years old, having been operated previously by defunct Kuwaiti carrier Wataniya Airways. The third aircraft is now being reconfigured into VietJet’s all-economy configuration by Garuda maintenance subsidiary GMF and will be delivered in early March. VietJet plans to add two to three additional A320s p/a over the next several years, which would give it a fleet of up to nine aircraft in 2013 and up to 12 aircraft in 2014. VietJet and Jetstar Pacific combined are now expected to give Vietnam an LCC fleet of about 25 aircraft within three years. While the growth seems rapid, the market should easily be big enough to absorb such an increase in LCC capacity as low fares stimulate demand both domestically and internationally. At 25 aircraft, Vietnam’s LCC fleet would still be much smaller than five other ASEAN markets – Indonesia, Malaysia, the Philippines, Singapore and Thailand. The opportunities in the Vietnamese market are enormous. While Jetstar has significantly improved its position to tap into the expected growth in Vietnam, there is still room for other LCCs. While Vietnam Airlines has improved its already dominating position in its home market, as well as its prospects for its planned initial public offering, the Vietnam market is big enough to support multiple players.